For the last eleven years, the LSBA has convened a Conclave on Diversity in the Legal Profession. The LSBA chose to host a "conclave" rather than a "meeting" because a conclave signifies "an assembly or gathering, especially one that has special authority, power, or influence. To register for the 2019 Conclave, please click here. Dima Ghawi, Dima Ghawi, LLC, Baton Rouge, LA. Throughout her career, Ms. Ghawi has led global teams, facilitated leadership workshops and initiated woman advancement programs. Her focus now is helping her clients with leadership, employee engagement programs, and women advancement programs. Ms. Ghawi’s life mission is to enable individuals across cultures to shatter their internal and external limitations. Dr. Katrice Albert, Executive VP of Inclusion and Human Resources. Dr. Albert is the NCAA’s executive vice president of inclusion and human resources. In this role, she leads efforts to enhance diversity, inclusion, leadership development, and education and community engagement. Additionally, she is responsible for leading national office employee relations, performance management, professional development, and compensation and benefits programs. Before joining the NCAA, she served in executive capacities with the University of Minnesota System from 2013 to 2017, and at Louisiana State University from 2005 to 2013. She led diversity, inclusion and equity strategies in both positions. The LSBA is committed to ensuring full accessibility for all registrants. Please contact the LSBA (at diversity@lsba.org) if you have a disability which may require special accommodations at this conference. Need a hotel room? We have a great rate! The LSBA has reserved a block of rooms at the Sheraton New Orleans at a discounted rate of $189.00 per night (excluding taxes and fees). You are urged to make reservations early, as there are only a limited number of rooms available at the discounted rate listed above. The LSBA room block is reserved for seminar attendees only. To reserve a room, please click here. All reservations must be guaranteed with a credit card by February 7, 2019 and the credit card will be charged a deposit of one night's room and tax when reservations are made. Any requests received after February 7, 2019 will be handled on a space and rate availability basis only. Please note that if your plans change and you do not timely cancel your room reservation by March 5, 2019, you are responsible for the room charge. Please note that wireless access will not be available in the conference area (on the second floor where the program will be held) and electrical outlets may be limited. Free wi-fi will only be available downstairs in the main lobby. We hope you can join us and look forward to your continued support of the LSBA's Diversity programs. Contact the Member Outreach and Diversity team members by email at diversity@lsba.org. Become a LSBA Diversity Signatory! 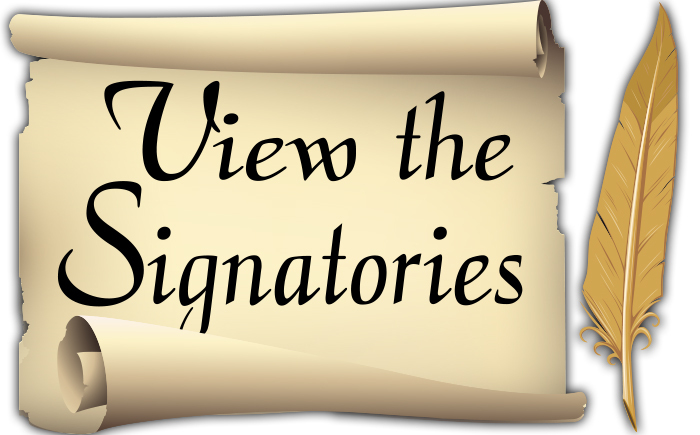 Click here to learn more about becoming a Signatory. Download the LSBA Statement of Diversity Principles. The Excellence in Diversity Reception honoring Diversity Signatories of the LSBA Statement of Diversity Principles will be held on Friday, March 8, 2019 at the Sheraton New Orleans Hotel at 8:00 a.m. – 8:45 a.m. Speakers, sponsors, and Conclave registrants are invited to attend. The LSBA is working on ways to reduce the amount of paper we use at seminars and symposia. This is an effort both to be responsible toward our environment and to increase the quality and timeliness of the resources provided through this learning experience. To view the course materials for this year's Conclave, please click the download link beside a session title below to obtain the materials available for that session. We recommend that you do so PRIOR to the seminar. If you choose to review the materials from an electronic device, we strongly suggest that you charge the device's battery, as electrical outlets are limited. If we are serious about future proofing all sectors (especially the legal profession) at every level, intentional efforts toward equity and diversity in the comprehensive talent strategy should be of highest priority. Across the nation and especially in my beloved State of Louisiana, there are far too many bridges yet to cross such that women, ethnic minorities, those with disabilities, LGBTQ, and other diverse citizens have full access to employment opportunities and career advancement. There is one thing that I know for sure and that is when diverse top talent is left on the sidelines, we are unable to accelerate innovation and race ahead. Therefore, with blazingly articulated courage and bold leadership, the legal profession must model the gold standard of purposeful and intentional inclusive excellence leadership. As nothing is more powerful than every Louisianan reaching their highest potential.This keynote address will offer conclave participates the “power of possibilities” in several distinctive ways. It will challenge the conclave participants to IGNITE leadership on purpose, to be future forward, and to bend the arch toward success by focusing on how to accelerate their unyielding commitment to equity and diversity. As nothing is more powerful than every Louisiana State Bar Association member heeding this call-to-action and becoming a champion for inclusive excellence. Locally and nationally, immigration issues have taken center stage with large-scale shifts in law and policies which stem from the current government priorities. This panel will take a look at the legal landscape of recent changes in immigration law, specifically focusing on DACA, changes in state law, challenges for immigrant children, asylum-seekers, as well as Louisiana-specific immigration issues. Pipeline Building a talented and diverse team internally as well as externally (outside counsel) is a collaborative effort. Without true leadership within corporate law departments of in-house counsel and outside counsel law firms, meaningful improvements in the areas of diversity and inclusion will remain elusive. Despite the increased attention to diversity, there has been little or no change in the racial or gender composition of firms. The lawyers at the top – those that have the power to drive Diversity and Inclusion (D&I) have an obligation to identify the best or most-renowned diverse subject-matter experts in the legal profession for future opportunities. Talent development is the role of not only in-house counsel but also outside counsel. This panel will explore key components of creating an internal environment for D&I and how leaders of legal departments can only improve the pipeline if they are involved in the effort of identifying and hiring diverse candidates. There is compelling research that diversity increases the competitive advantage of companies, enhances creativity, and elevates employee engagement. Despite this, there is still resistance to workplace diversity. Through engaging personal narratives, Ms. Ghawi shares the many different types of diversity beyond race and gender and covers its proven benefits. She provides the audience with tools to enable them to increase diversity in their teams and focus on attracting, engaging and retaining diverse talent. The audience gains new understanding of managing resistance, tracking progress, and creating a climate that celebrates diversity in their company. 1:10 p.m. - 1:20 p.m.
#MeToo and Beyond: What Have We Learned And Where Will We Go? The #MeToo movement continues to propel a national dialogue on the importance of recognizing and combating harrassment in the workplace. What are some of the lessons that employers have learned about the need for changes in workplace culture? How are in-house and outside counsel advising their clients on best practices and approaches to confronting risks and realities? How is the legal community addressing its own issues around harrassment in the workplace? This session will delve into each of these dimensions of the movement and explore the kinds of new thinking and approaches needed to end harrasment and foster safe and respectful workplaces for all people. Andrea L. Gilliam, CEO, Unwanted LLC, Washington, D.C.
Jenny R. Yang, Strategic Partner, Working IDEAL, Washington, D.C.
Lawyers play a vital role in advancing social justice issues. We constantly ask ourselves "how we can help" or are asked by others "can we help?" As advocates, we want to represent underserved communities and champion causes that seem impossible. Sustainability seems challenging when there is so much work to be done. This panel will explore what are our legal and moral obligations as lawyers and as members of society to protect disenfranchised groups. The LSBA Diversity Committee and Conclave Subcommittee would like to take the time to thank all of our generous sponsors and co-hosts who support the Conclave on Diversity in the Legal Profession. If you are interested in sponsoring, please click here for the sponsorship form. Stone Pigman Walther Wittman L.L.C.